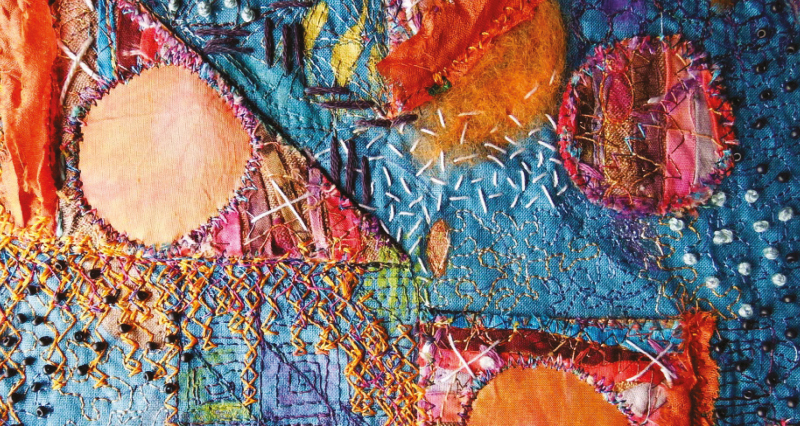 This workshop teaches 12 free motion quilting designs as well as the use of tulle and wax crayons to make designs colourful and interesting. This workshop explores the use of a coloured baby wipe to create a fun and unique art piece. Inspired by the art ofFriedrich Hundertwasser, the designs are odd shaped houses and oversized flowers. 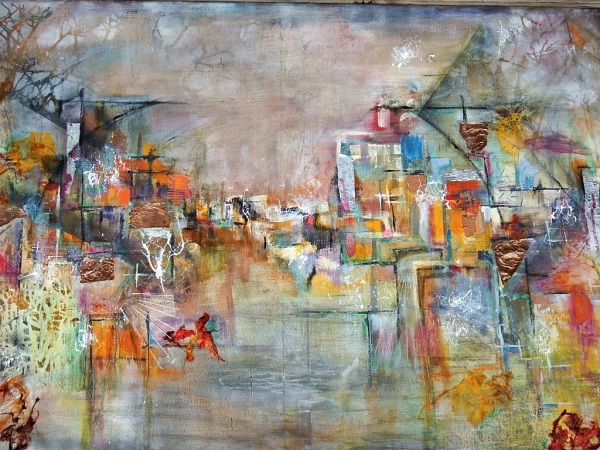 This workshop is a mixed media class that explores several image transfer techniques and the use of mixed media. 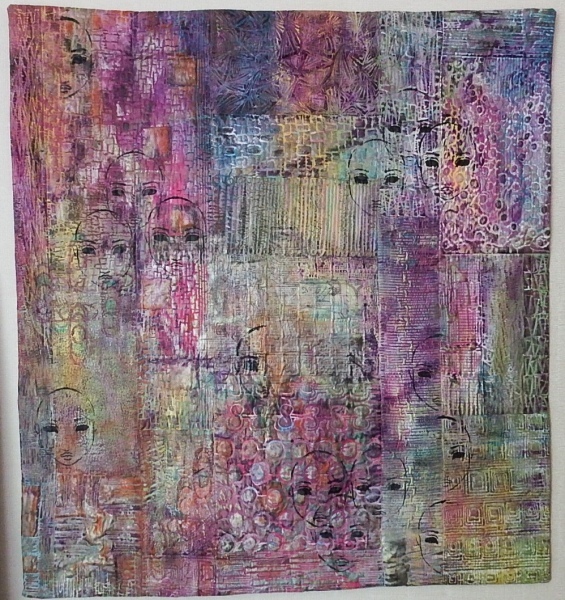 Design ,colour choices and stitching will make this a unique art piece to hang in any sewing room. 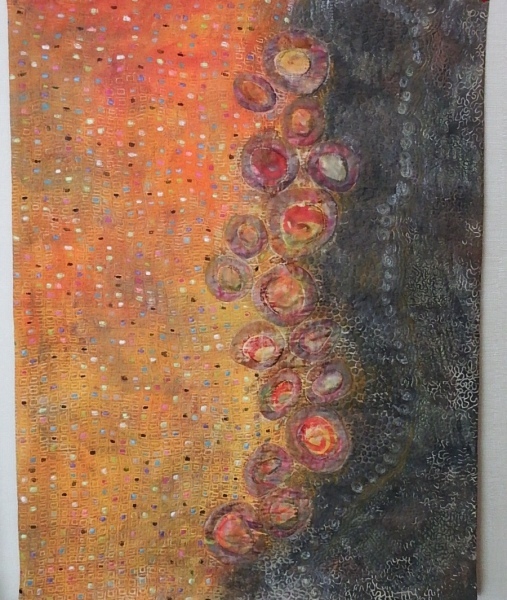 This workshop introduces you to the process of creating an abstract art piece. 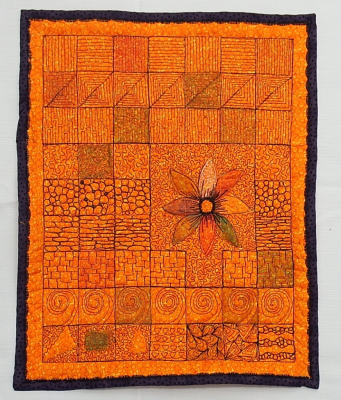 Design, colour choices and stitches to make your design cohesive and interesting will be discussed and will give you confidence to create your very own unique art piece. 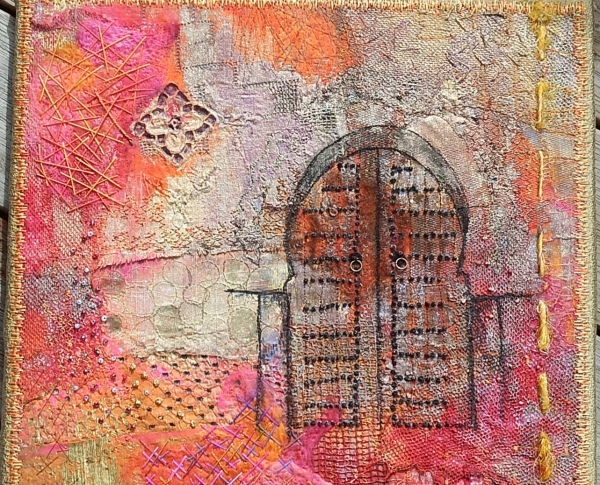 This workshop is a two day gelli plate printing class, using your very own unique printed fabric to create a wall hanging. 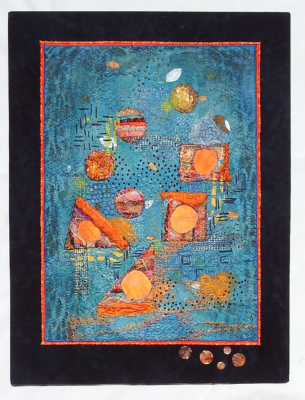 Free motion quilting and added colour, stitching and beading will enhance and complete the art piece. 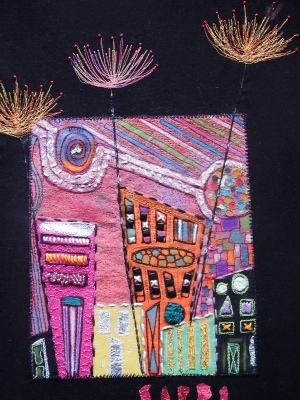 Textile Art is my passion! 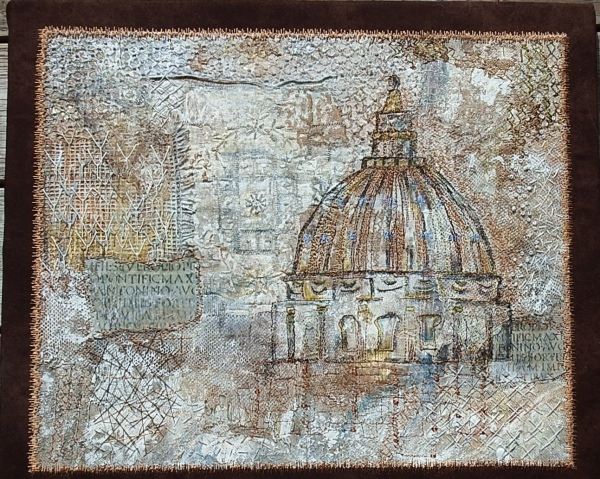 I love to stitch, using my sewing machine and hand stitching to create unique art pieces. 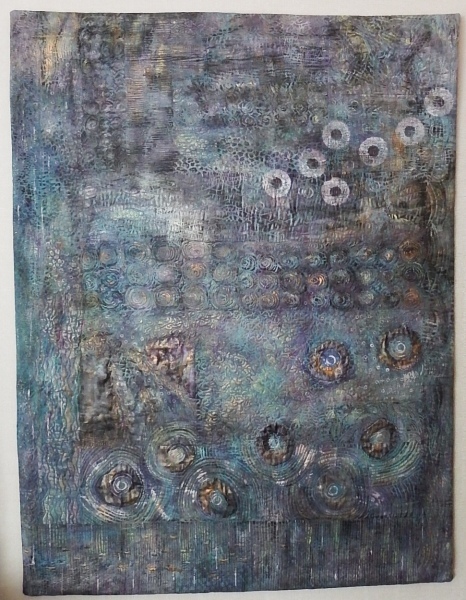 I also explore surface design, using foils, stencils, copper, paint, felting and burning.The aim is to create many layers of interest that draw the viewer in closer to explore my art pieces and see something new every time they look at them. I also paint and create unique, one off pieces of art using acrylics and mixed media. Painting gives me the freedom to create quicker on a larger scale but always adding some form of stitching or fabric to my art piece. Truly unique art that will bring you joy for many years to come. Teaching and sharing my knowledge and experience are another passion of mine. My workshops give participants the opportunity to explore different techniques and take them on a creative journey. At the beginning of a class many students say that they are not artists. Art can be learned and the best compliment I get is when participants say: I had no idea I can do this. Workshops can be organised by request for smaller groups which are held at my home in a lovely rural setting. I also have scheduled classes at Country Dawn, a quilting shop in Whangarei, New Zealand. Please check www.countrydawnquilting.com for further information on classes. I sell my art through events in Waipu, New Zealand and during the summer months in Paihia, New Zealand and online. Waipu Boutique market is held every second Sunday of the month and the Cruise Ship Markets are held during the summer months when a cruise ship anchors in the beautiful Bay of Islands. I also have several art pieces displayed at Country Dawn, 38 Reyburn Lane, Town Basin,Whangarei, New Zealand and upon request,private visits can be arranged.